At lunch time, we have the habit of watching a TV series episode on one of the projector room big screens. We usually get a carry-out from some food joint and lock ourselves up for the next hour. When we finished the second season of The Office, my friend popped-in a (Japanese) anime, Kino No Tabi , supposedly to act as a filler before we could find something else. But after watching just two episodes I was hooked. I have never watched anime before and I am impressed, to say the very least. 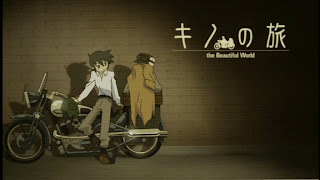 Kino Na Tabi(Kino's Journey) is a deep, thoughtful, character driven anime. It is the story of a girl named Kino who travels the world with her talking motorad Hermes. In the series, we come across countries with some very strange customs and traditions. As we watch each country through Kino's eyes, no viewpoints are forced on us. The information is there for each one of us to interpret and assimilate. It just tells you the story without necessarily giving you all the answers...very very thought provoking! "The world is not beautiful; Therefore, it is." rings deeply in my heart. The sky is boundless, because it's the mirror of my soul.It changes colors everyday, as if it's reflecting my heart. Words can't do this beautiful anime enough justice. Watch it and get a whole new perspective on life.